Monograms are the Integrity Toys couture fashion dolls, wearing often designs of Jason Wu translated from his catwalk or inspired by them. Other times they are dressed with brilliant sartorial creations that reflect a higher, more unique aesthetic than that of the other doll lines of the company. Magnificent is no exception to the rule; in fact, she probably encompasses all that the line stands for: elegance, quality, uniqueness, brilliance. I had written about this doll when the company sent out the e-mails informing us about their release, the previous photos making me drool with anticipation. It is good to find out that the doll actually is better than what you expected. Magnificent truly lives up to her name. And in her limited edition of 300 she is bound to be highly coveted. Her face is the classic Monogram sculpt, with a brilliant make up palette of light-handed smoky lids on her eyes (which are almost violet!) and red fiery lips. Her beauty spot enhances her glamour, while her hair is swept away from her face into a very imposing up-do, framed with a plait like a halo. It reminds me a lot of similar hairdos from the late 60s and early 70s, popular with the couture-wearing ladies. Her gown is a dream. A Magnificent dream. Spun like a Dior or Charles James couture gown, it folds around her body in a soufflé of drapes and folds and tucks, the two colours making a distinct separation of front and back, while the top of the gown finishes of in a knot on her chest. 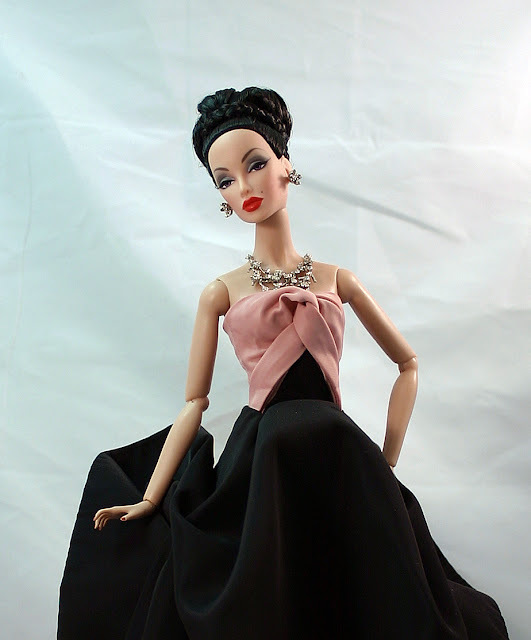 Dramatic and elegant, it is a dress that does not pass unnoticed and was a favourite with many collectors, especially after seeing for the first time, in another incarnation, on the Smouldering Monogram doll in the Integrity convention in 2010. The back of the gown is as good as the front. The two points of the black fabric are supposed to connect at the back with the appropriately placed hook but I started the photo shoot without it for added drama. Above is the gown unhooked at the back. And here (above) you can see it hooked. Haute. Her jewellery suite is a perfect compliment to her outfit: flower shaped earrings and a matching necklace set with crystals enhance her beauty and match the gown perfectly. A ring or bracelet would have been a welcome addition. A small clutch or egg-shaped bag would have been great too. Her shoes are strappy high-heel patent "leather" sandals, great looking but a bit harsh for a gown of this style. Classic silk pumps with flower decorations at the heel and/or an open toe would have been much better IMHO. But the fact remains that Magnificent is truly a doll that lives up to her name. She will make a great addition to most fashion doll collections. She is realy magnific,I love her.